The airport is a place where dreams come to die. It is the perpetual waiting room of austerity and confusion. Walls line with cologne-perfumed-electronic-gadgets-cheapfigurines-lame tshirts-fastpizza and maybe, if one is lucky, some un-melted dark chocolate in a gift shop. Mozambique has allowed more than one of us an appreciation for this. Maybe this is why travelers are so relieved to have conversations with the person they are seated next to, or across from. Any kind of conversation. On the journey forward, I found the most intriguing interaction between myself and a London couple who had one seat in-between us. The interaction included a smile and a nod when I ordered a second glass of cabernet after dinner. They soon followed suit. This marked the end of our conversation. In-flight entertainment helped of course. I have had many flights with very little talk – and also shared quite the opposite. I’m one of the ‘put two books in the seat pocket in front’, ‘read the newspaper,’ and ‘plug in your earphones’ passenger. I’m also the ‘indulge the next person’s need for companionship to be nice’ woman. My departure home used my skills from the latter prototype. My episode occurred with a young lady from Nampula who adjoined my flight home leaving South Africa – there was no nonverbal communication this time. She wanted to talk. “No. I just came back from Ireland,” I responded. “Really? Do you like it?” she asked, incredulous. “Yes. I miscarried and the baby was growing inside me for many months but I had to go to see the doctor.” She replied matter of factly. “You couldn’t go to Nampula? Are the hospitals better in South Africa? I’d been told that there was a very big general hospital in Nacala Porto.” I said with fervor. It was gathered through further conversation that not only did Carrie, the name I will call this woman, have several children – she also had them from different fathers. In addition, the man she called her husband was actually her soon-to-be groom who would marry her in two weeks. This is not such an uncommon occurrence. In this country and perhaps other Southern African nations as well, people meet and conceive of the birth of a child almost as an immediate product of a romantic alliance. It is unusual that it is imagined as a shared connection so quickly because it often loses its physical ties almost immediately if not conceived in marriage – and this is also uncommon at the start. In the Westernized world where marriage is traditionally a unification of love, this is arguably a discussion to be tabled in Mozambique. Men and women often ‘hook up’ and a woman intends to provide him with a child to secure his commitment. However, I have already spoken to women who never knew their fathers, or fathers who have long left their sons and daughters behind. Family planning here requires a different cultural lens than the ones we look through in American, French, Dutch, and German googles – they ask us to look at the value of the woman and the value of the tribe. Unfortunately, the value of a woman seems to be her ability to produce several children, even under the pretense the man may not be around. Strange way of thinking, but I have heard more conversations than I can count on this subject – many ending with the conclusion that women often have a child to ‘catch’ a man – despite knowing that in Mozambique, he probably won’t be around anyway. This is a bleak portrait of the country indeed, but a harsh truth. I thought of how blessed I was, but more than that. Here was me – boarding an airplane to an exotic land that held such promise – Mozambique has more to offer me I’m sure – after coming from the beautiful land of Eire. Ireland is surely the land of rain, but it also has storms that give it the penname William Drennan put to ink: The Emerald Isle. What could I do about Carrie’s situation? Maybe not much yet. But one day I will be in a position to explain why things don’t need to be in this way. Surely all this street-wise education is going to teach us all something more than book smarts could ever do. Meanwhile back at the ‘ranch’ in Nampula, I got off the airplane and studied the sun. Home at last. Where-ever home may be these days. 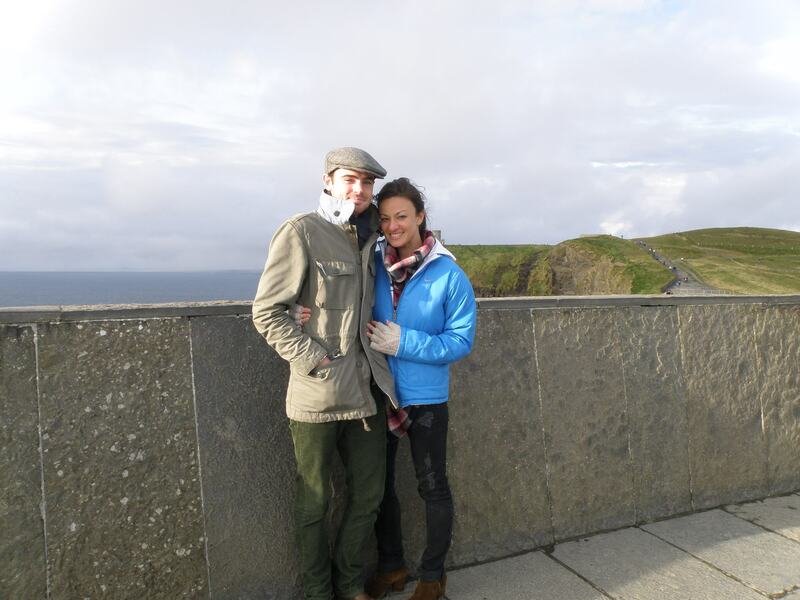 2012: On a brisk, chilly day just in front of the Cliffs of Moher as the sun came out. Thanks, Michael. It isn’t always pretty – but I mean to show the good and the ugly side of it. After all: it is all important.